Set of all five of Nova's Featherweight Cards (Nova's 222K Featherweight Maintenance Card, Nova's FW Basics Card, Nova's FW Troubleshooting Card, Nova's FW Attachment Card, and Nova's FW Cosmetics Card). The Maintenance Card in this set will be for the 222K. The other 4 cards are the same as for the 221. All five cards are 8 1/2" x 11", laminated with full color photographs and information on both the front and back of the card. The cards are laminated for durability and lay flat for ease of use. Photographs are full color, clear, sharp and have numbered 'pointers' for identification of areas to be targeted. 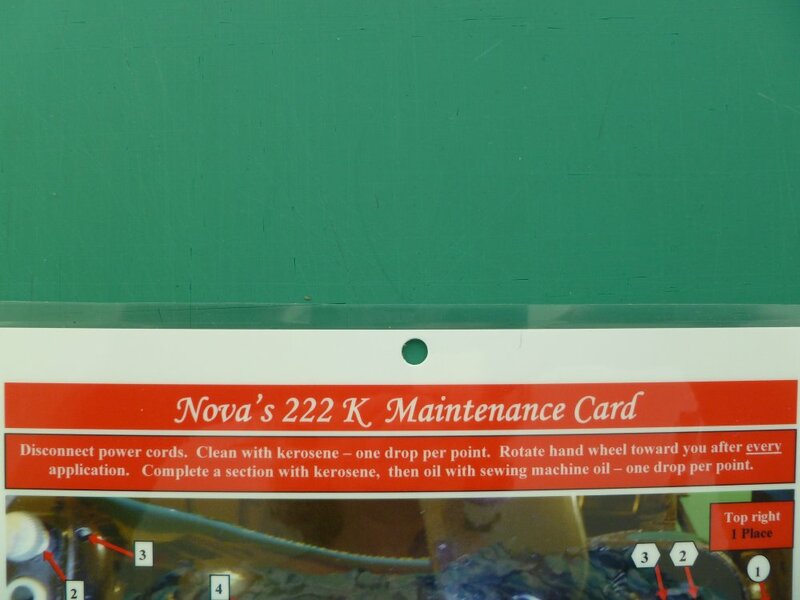 Photo shows a small sampling from the Maintenance Card. The cards were developed because of student requests and have been extremely popular. "Hi Nova! Both the Nova's Featherweight Maintenance Card and foot control that I ordered arrived today. I LOVE the Maintenance Card! I had so dreaded oiling the machine. With your card, oiling was a breeze. Thanks a million! I was worried about the wiring to my original foot pedal, therefore, I was glad to get the new one. Also, I am a Bernina user, so I'm comfortable with the new foot pedal. I have a feeling that I'll probably always use the new foot pedal now. Oh, I just finished making a quilt top on my 1952 Featherweight. Thanks again for the excellent service!" "The order arrived yesterday. Thank you. I absolutely LOVE your featherweight cards!!! They are clear and concise and well illustrated. WOW!!!"